NETWORK UPDATE: SUPERGIRL will have to share the honors for the fall’s highest-rated premiere, as its 0.1 drop in final numbers tied it at 3.1 with the debut of BLINDSPOT. As we noted this morning, the numbers through the hour were very consistent (3.3/3.0/3.2/3.2), which bodes well for a solid hold next week (albeit at a likely diminished level), but as a CBS show it skews much older than CW’s THE FLASH (even though its 18-49 rating was more than double FLASH’s last week, its 12-17 share was only up about 15%). SUPERGIRL’s hold of its BIG BANG THEORY lead-in was lessened a bit because while it lost 0.1 in final numbers, BIG BANG gained 0.2–still a terrific result compared to LIFE IN PIECES, which routinely loses half that lead-in. 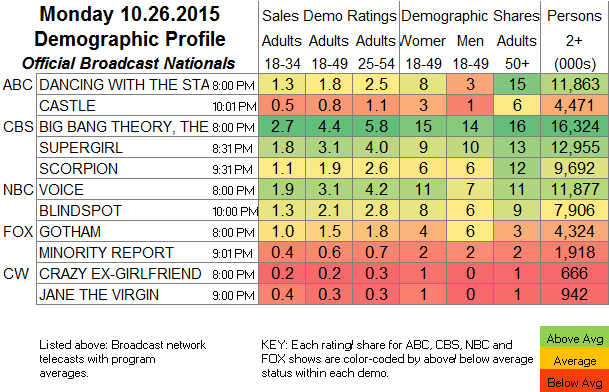 In addition, BLINDSPOT, DANCING WITH THE STARS and CASTLE each lost 0.1. A footnote: CRAZY EX-GIRLFRIEND looked even worse in the demos, where it had a zero share among most male age groups. CABLE HIGHLIGHTS: How much was the STAR WARS trailer worth to last week’s MONDAY NIGHT FOOTBALL? Obviously the game itself matters, but in raw numbers this week’s telecast was 0.82 below last week’s at 4.37–still enough, of course, to beat everything on cable and broadcast except BIG BANG THEORY. The rest of Monday’s leaders were the usual group. On VH1, LOVE & HIP-HOP gained a tenth to 1.47, and BLACK INK CREW: CHICAGO was down 0.26 from last week’s CREW episode. USA’s WWE telecast was at 1.28-1.07, compared to last week’s 1.20-1.08. On Bravo, REAL HOUSEWIVES OF ORANGE COUNTY gained 0.26 to 1.11, and LADIES OF LONDON was up 0.08 to 0.36. 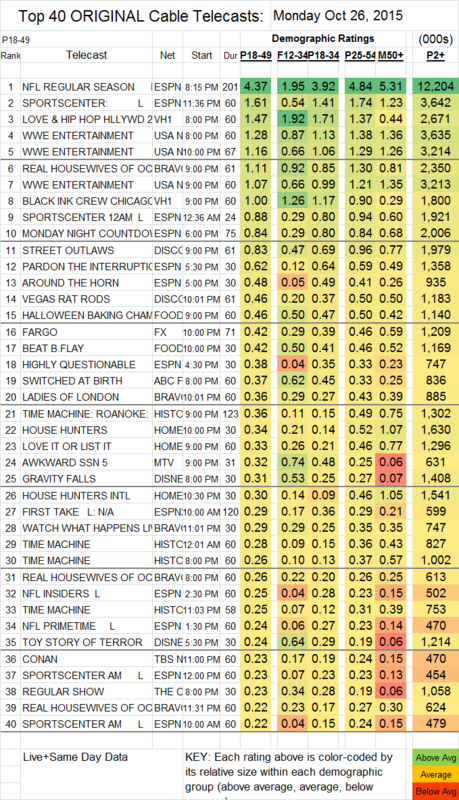 On Discovery, STREET OUTLAWS (which aired a clip show last week) was at 0.83, and VEGAS RAT RODS gained 0.04 to 0.46. Some good news for fans of quality TV drama: FX’s FARGO, which took a dive last week, recovered by 0.15 to 0.42. The season finale of ABCFamily’s SWITCHED AT BIRTH fell 0.06 to 0.37 (and also dropped 0.06 in the F12-34 demo to 0.62). On MTV, AWKWARD fell 0.05 with 18-49s to 0.32, and dropped 0.16 in the target demo to 0.74, while FAKING IT lost 0.03 to 0.20, FOLLOW THE RULES debuted at 0.17, and GIRL CODE LIVE was steady at 0.08.